If you have ever stayed a night in a hostel dormitory, you probably have an idea of how little privacy exists here. You can either smell your neighbor’s well-traveled (and little-showered) feet, or you can kiss him or her goodnight without moving a muscle (don’t, by the way). The 91 Loop boutique hostel in Cape Town has found a brilliant solution, derived from a futuristic Japanese design: sleep pods! 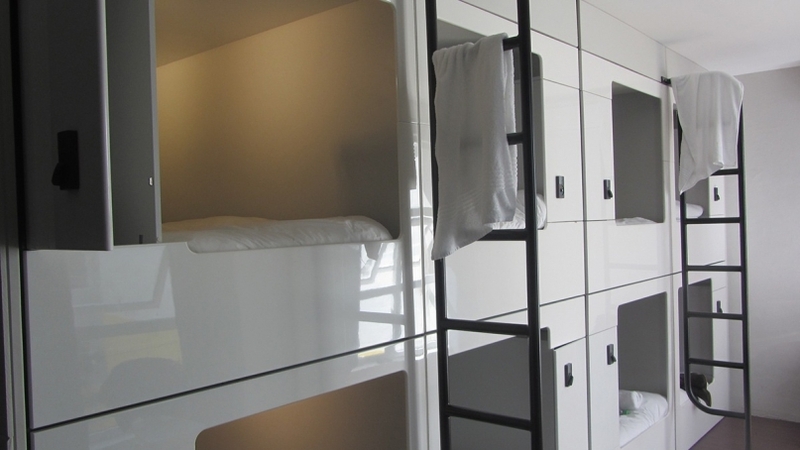 Even though they look a bit like a scene from the “Alien” trilogy, they are everything you have ever dreamed of, if you have ever dreamed of a utopic hostel dormitory. 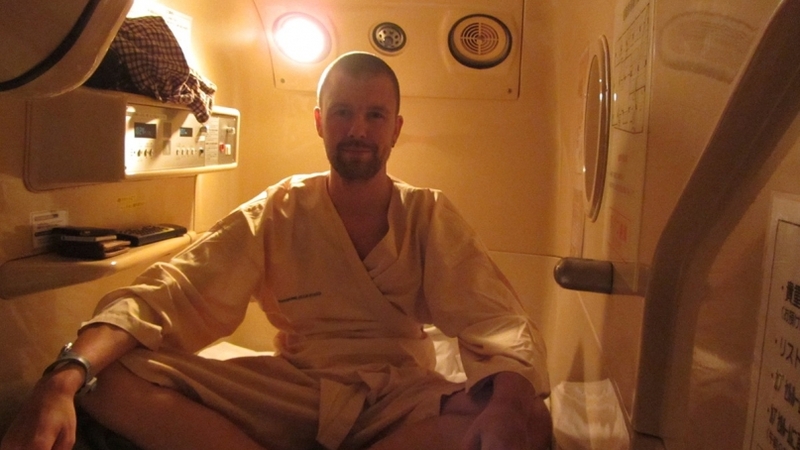 On my trip to Japan in 2013, I stayed in one the famous capsule hotels in Tokyo. Althrough these capsules look a bit similar to the ones at 91 Loop, but their purpose is slightly different. 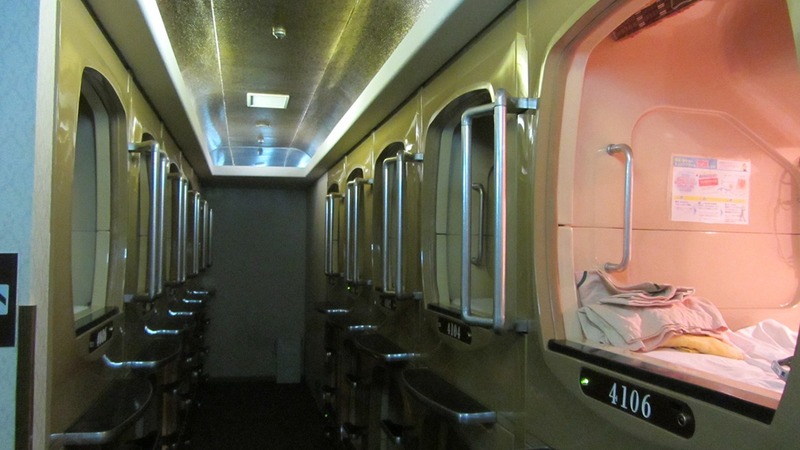 Japanese men (the pods are separated by gender) that are too drunk to go home end up staying at a capsule hotel to avoid the often long commute to and from work in Tokyo (and the embarressment to face their spouses). 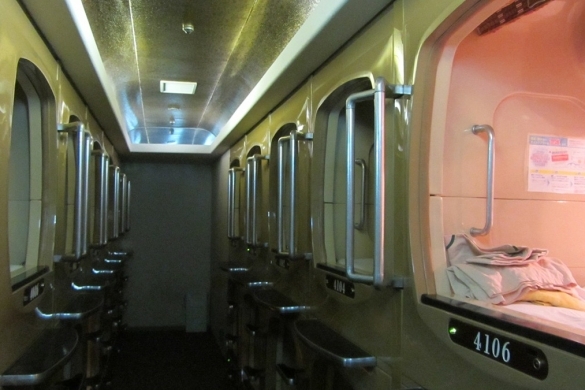 The capsule hotels are often combined with a public bath (read: spa) as well, which provides some great hangover relief. The capsules themselves come with wireless internet, a small TV, radio, a mirror, a ventilation system and blinds for maximum privacy. 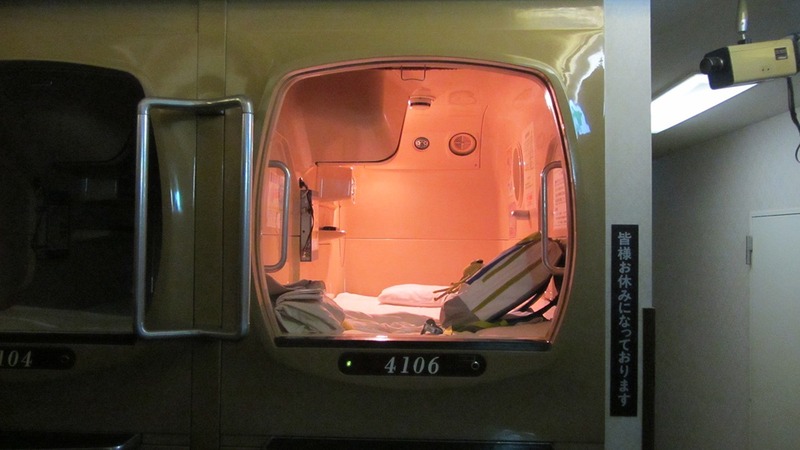 As the capsule hotel is a relatively cheap form of accommodation in Japan (it was still about 30 EUR or 34 USD per night when I was around), some (unemployed) people make it their home, paying “rent” monthly for as long as they need it. 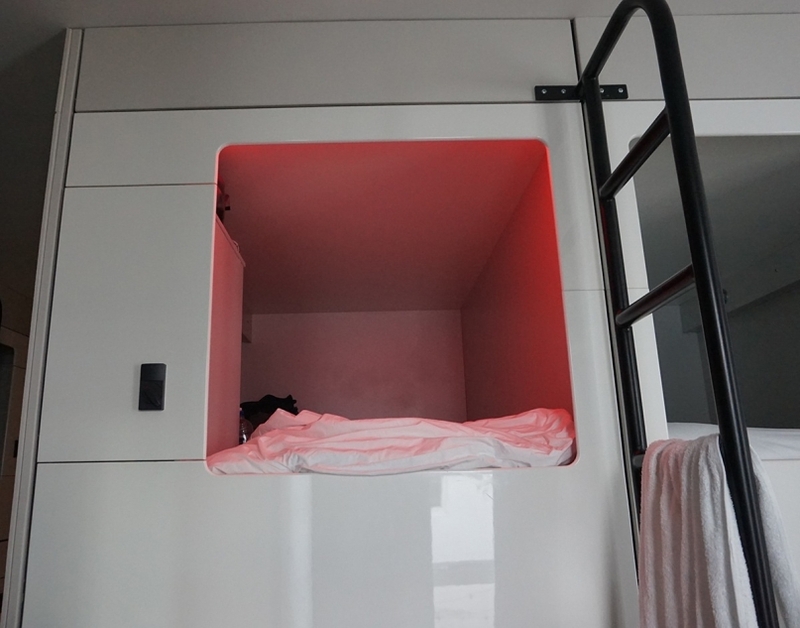 I did get a bit claustrophoic, as I’m tall for Japanese standards (6 ft, 1.85m), but overall I was fascinated by the concept of these mini-bedrooms. 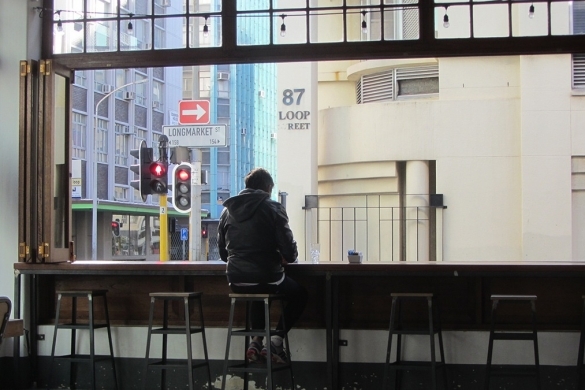 If only they would make them look and feel a bit less cold, static and cramped… Here’s where 91 Loop in Cape Town comes in. 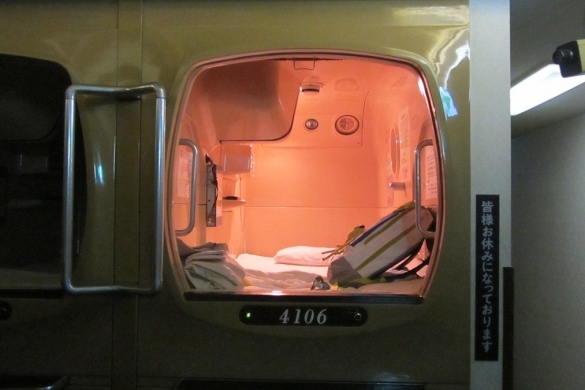 When the owner of the 91 Loop hostel stayed in a Japanese Capsule Hotel, he experienced a little bit of claustrophobia himself (being even taller than I am). He decided to use the same concept but with a few adjustments: no gadgets such as TV and radio and much more space. And you were also not required to wear a bathrobe all the time, which was the case in Japan (which I didn’t mind, to be honest). The clean white design, bedside locker (which can be opened with your magnetic door pass) and ample (international!) power sockets really show that the owner has learned from the common dormitory frustrations (and perhaps his own experiences). I’m happy when this little head pops up from the sleeping pod below me. Being able to sit in my pod without being constantly distracted by others was great for the introvert in me, and, at first, I wished there were blinds to completely shut off from the world for a little bit. Then, after giving it some thought, the lack of blinds is actually what makes these pods so great: you have your own space but still have an idea of what’s going on the outside, and it’s much less of a psychological boundary to be a little bit social. They are, after all, dorms and not private rooms. Another great feature was the “drunk-light”. Imagine barely making your way back to the dorms late after an evening of social drinks, only to find out that the main light has already been turned off and people are sleeping. Instead of waking everybody up by switching on the main dorm light, you can swipe your card on a sensor close to the entrance door. Your pod then lights up in a soft hue and stays on for quite a while (giving you enough time to literally crawl to it). Problem solved! Always find your sleep pod in the dark with this “drunk-proof” pod light! 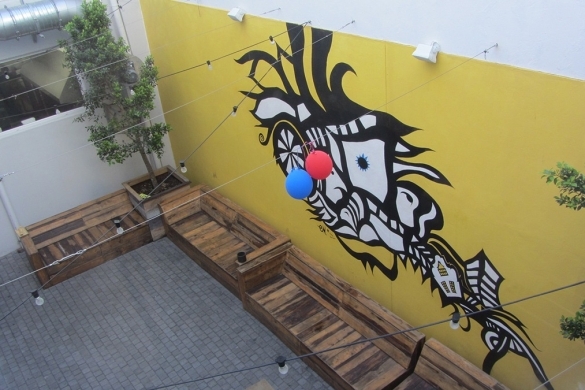 Taking it easy seems to be the status quo at the 91 Loop hostel. 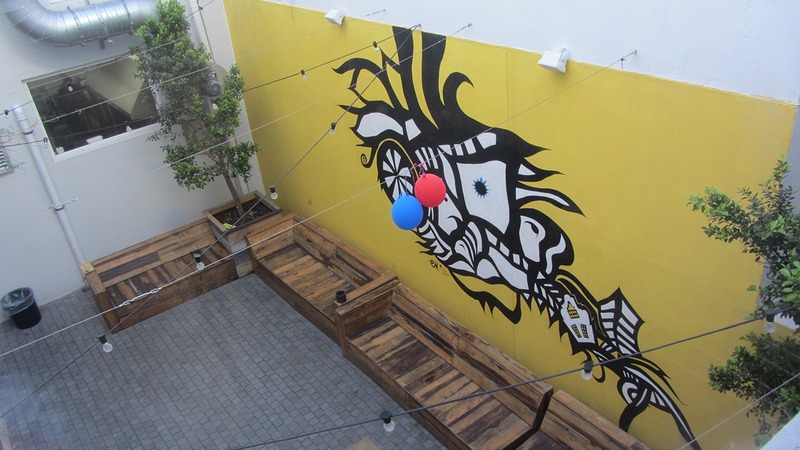 After setting foot in the large open common space, it seems that everybody was doing their thing: whether it was silently working on their laptop, having a chilled conversation with friends with a beer, or playing ping-pong in the courtyard. 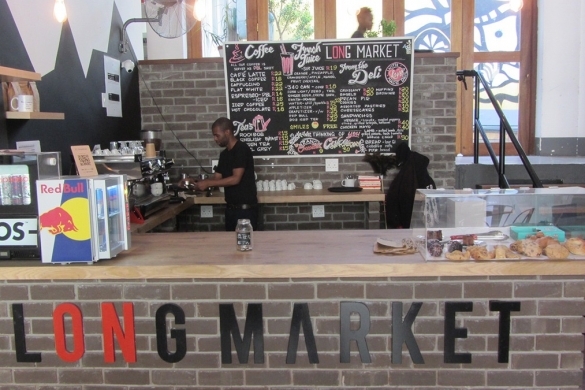 Several spaces flow into each other: the bar area of the hostel is named “The Honey Badger”, and the cafe next door (which can be reached without leaving the building) is called “OnLongMarket”. 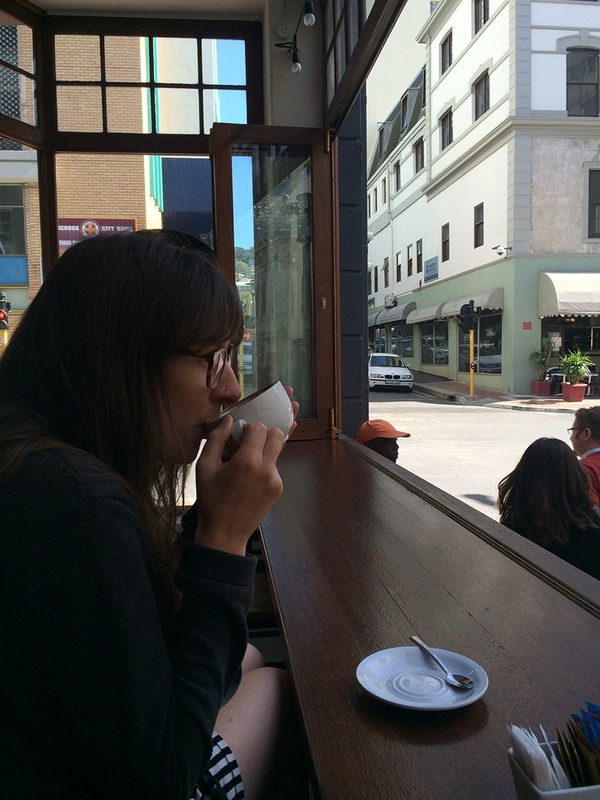 All of them draw their own crowd, creating a nice mix of locals and backpackers. 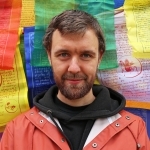 The friendliness of the staff deserves a mention on its own. They were straight up cool, friendly and very helpful. In your welcome package, there is a voucher for a welcome drink at the bar, which is of course very welcome after a long flight! The rooms have city names, not boring numbers, which is a nice touch. In the morning, you can enjoy a free breakfast with cereal, toast, marmalade, cheese, and tomatoes. For 28 RND extra (around 2 Euro) you can get a deluxe breakfast, with a deluxe coffee (flat white, cappuccino, latte etc.) and two eggs prepared according to your preference. 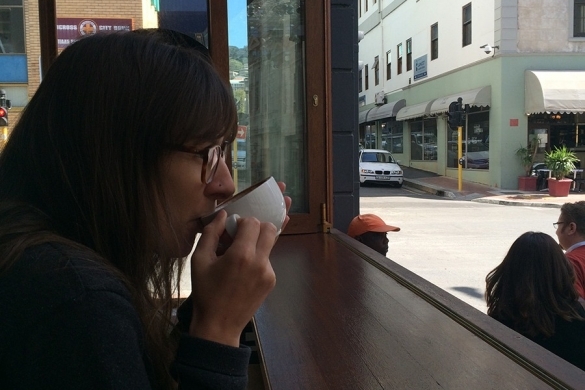 I personally loved the deluxe option, as coffee and eggs are the cornerstones of my ideal breakfast. 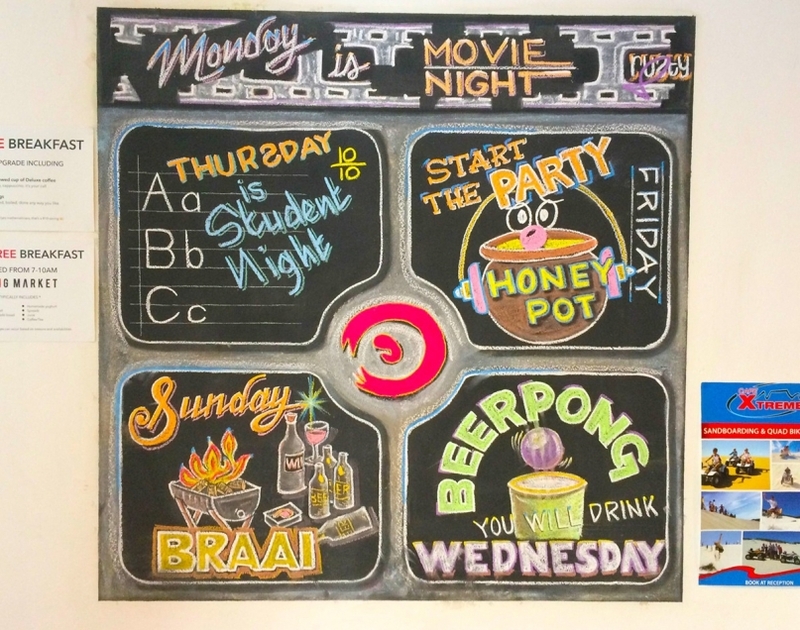 There are several activities you can enjoy at the hostel such as “student night Thursdays”, “start the party Fridays”, “Sunday braai” (sort of bbq) and “you will drink beer pong Wednesdays”. Most of the activities are in the courtyard, underneath the dorm room, but I was surprised how well the sound gets blocked out if you close the windows when you need to catch some Z’s before the festivities are over! 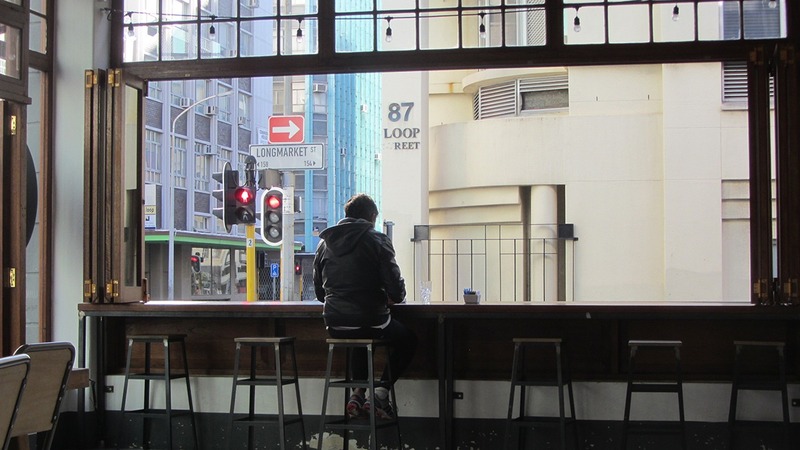 If you’re concerned about safety, you’ll be happy to hear that in the evenings there is always a person at the door to keep an eye out as the city gets dark, quiet and a tad shadier. They also take a few other measures to ensure that your belongings are safe. 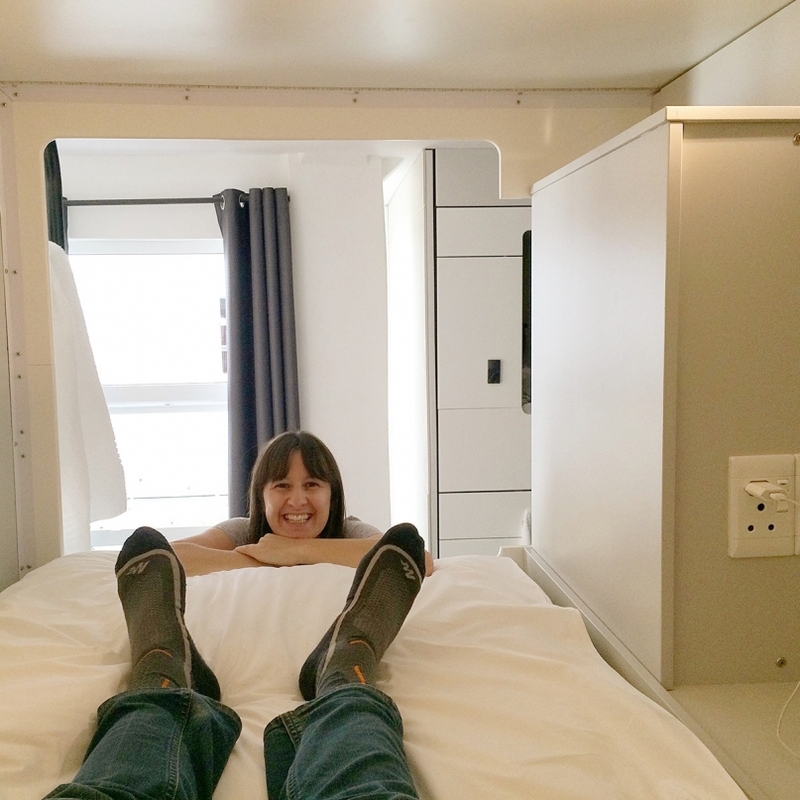 Sleep pods and the 91 Loop Hostel: yay or nay? The House of Machines if you have to catch up on some work, or for a beer in the evening. La Parada, one of the best tapas restaurants I’ve ever eaten at. 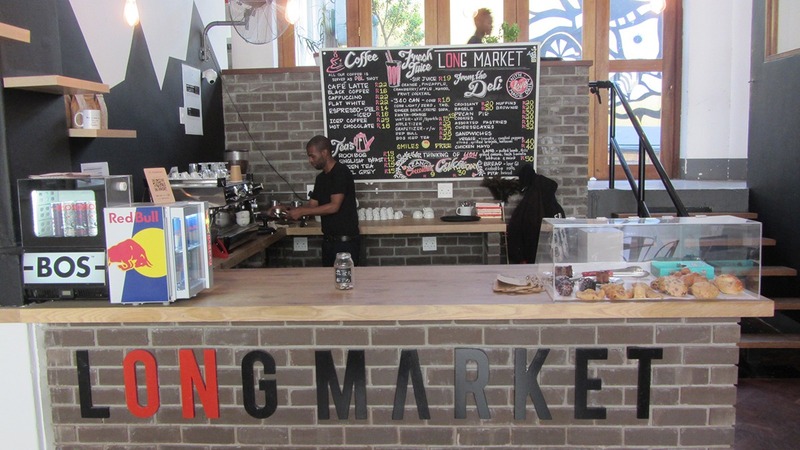 Tiger & Milk, for burgers.